When was the Wheel invented? Historians tend to agree that the Wheel was invented in c.3500 BC and the first known use of the Wheel was during the Ancient World period of inventions (3500 BC - 600BC). Who invented the Wheel? The name of a specific person has never been credited with the invention of the Wheel. The invention of the Wheel is so old that the name of the inventor has been lost over time, although the first use of the Wheel is believed to have originated in Mesopotamia. The invention of the Wheel is considered a tremendous advancement in the field of Transportation. Definition of the Wheel: The Wheel is defined as a circular object first used as a wooden roller, made from logs, to carry loads over the ground. The wheel was improved by the addition of spokes, a hub, and a circular rim. Wheels were then attached to a shaft or frame used as a form of transportation e.g. the chariot. Metal rims and then rubber tires were then added to wheels for strength and durability. Fact 1 Who invented the Wheel? The name of the inventor of the Wheel is unknown but it is believed to have been invented in Mesopotamia c.3500 BC during the Ancient World era of inventions (3500 BC - 600BC) and was paramount to man's advancements in the area of Transportation. Fact 2 Who invented the Wheel? Where was Mesopotamia located? Mesopotamia is the ancient name for the land in the Middle East that lies between the Tigris and Euphrates rivers. The majority of the ancient land of Mesopotamia is now part of modern day Iraq, Syria and Turkey. Fact 3 Who invented the Wheel? Who were the Mesopotamians? The Mesopotamians consisted of several ancient civilizations including the Hebrews, the Sumerians, the Assyrians and the Chaldeans aka the Babylonians. Fact 4 Who invented the Wheel? Prior to the invention of the Wheel in c.3500 BC, it was difficult to move heavy objects and roads had not been invented to facilitate a smooth and efficient means of travel. During the Neolithic Period, aka the Stone Age (3000 - 1800 BC) massive Stone Monoliths such as Stonehenge made use of large stones called Megaliths which weighed up to 4 tons and the super stones called Trilithons which weighed about 45 tons. Fact 3 Who invented the Wheel? Ancient stones were moved from quarries by river whenever possible or by sheer man power to pull or drag the huge building stones. It is also probable that the Stone Age man waited until the cold winter months, when huge loads could be more easily transported across ice. Fact 4 Who invented the Wheel? Prior to the invention of the wheel heavy loads were dragged across icy land using ancient sledges or sleds, mounted on runners and pulled by dogs for transportation over snow. In warmer countries ancient civilizations such as the nomadic Native American Indians developed other forms of transport like the travois, that consisted of two main poles lashed together bearing a platform for a load that was dragged easily over the prairie grassland, with hardly any friction. Other civilizations used wooden logs that could could be rolled and used to haul heavy loads. Fact 5 Who invented the Wheel? The Potter's Wheel: It was not until the Bronze Age (1800 - 600 BC) that Ancient civilizations moved from the hunter-gather lifestyle to a sedentary farming lifestyle in permanent settlements with year-round agriculture. The ancient Mesopotamians began to build towns and cities and developed trade. Their settled lifestyle in permanent houses required pots and containers and c.3500 BC they developed the stone Potter's Wheel. The Potter's Wheel is believed to be the first type of wheel that was invented. The invention of the wheel for a first means of transportation in a chariot followed 300 years later. Fact 6 Who invented the Wheel? The Potter's Wheel: The invention of the Potter's Wheel was the result of an unknown Mesopotamian cutting out a slice of a log and chiseling a hole in the middle to create the first wheel. The Potter's Wheel developed into a mechanical device consisting of a turning wheel that was rotated by kicking the flywheel with the foot which left both hands free to make and shape pots. The invention of the Potter's Wheel provided a means to create pottery in useful, symmetrical shapes both speedily and efficiently. Fact 7 Who invented the Wheel? The first use of the wheel for transportation was 300 years after the invention of the Potter's wheel, probably in Mesopotamian chariots and carts in 3200 BC. Fact 8 Who invented the Wheel? The Cart and Handcart: The invention of the Wheel led to the development of the simple cart in 3200 BC, with either two or four wheels, drawn by animals, such as oxen or horses. The handcart, a two wheeled vehicle designed to be pushed by a person was also invented at this time. Fact 9 Who invented the Wheel? The Chariot: The invention of the Wheel also led to the development of the Chariot. The invention of the chariot led to important changes in ancient warfare tactics and techniques by providing the elements of speed and surprise when attacking the enemy. Fact 10 Who invented the Wheel? The Chariot: The chariot was a horse-drawn battle vehicle, usually on two wheels, drawn by one or more horses. The chariot often carried two standing people, a driver and a fighter whose hands were left free to use various weapons such as the bow-and-arrow, spear or javelin. Fact 11 Who invented the Wheel? The Chariot: The first chariots were heavy vehicles with solid wheels, their bodywork framed with wood and covered with skins. The oldest known wheels were wooden disks consisting of three carved planks clamped together by slanting struts. Fact 12 Who invented the Wheel? The use of the chariot quickly spread across the East and the west. In 2000 BC the ancient Egyptians invented the first spoked wheels consisting of rods radiating from the center of a wheel. The spoked wheel was lighter and stronger than wheels made of solid wood. Fact 14 Who invented the Wheel? The Wheelbarrow: Wheeled technology spread rapidly and reached China in the middle of the third millenium BC. The Chinese inventor Ko Yu then invented the wheelbarrow. The useful wheelbarrow was a light vehicle consisting of two handles and one wheel, rolled by a single person for conveying small loads. Fact 13 Who invented the Wheel? The next innovation regarding the Wheel was the invention of the Celts who placed iron rims around their chariot wheels c 1000 BC to provide extra strength and durability to their war vehicles. Fact 15 Who invented the Wheel? Wagons In the first century BC the Ancient Romans not only used chariots for warfare, processions and transportation but also invented sprung wagons for long overland journeys. Fact 16 Who invented the Wheel? Time moved on and the invention of Wheels led to the Medieval invention of elaborate, highly decorated carriages and coaches used for transportation by nobles and the wealthy. In the 15th century, carriages were made lighter and needed only one horse to haul the carriage. Fact 17 Who invented the Wheel? The invention of Wheels then enabled the invention of the bicycle. The Pedal Bicycle was invented by Kirkpatrick Macmillan in 1839 during the Industrial Revolution era of inventions. 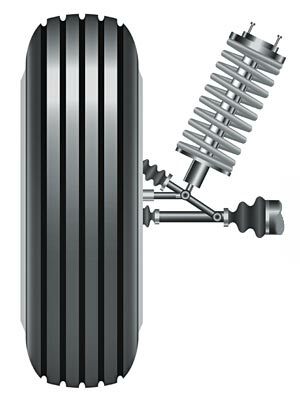 In 1845 the first air-pumped pneumatic tires were invented to eradicate bumps and jumps on journeys. Fact 18 Who invented the Wheel? Steam, coal, electric and finally gasoline cars were invented that revolutionized transportation forever during the 20th century. Refer to the Invention of the Automobile. Fact 19 Who invented the Wheel? The invention of the humble Wheel had a massive impact on transportation and lifestyles starting with the invention of the potter's wheel, chariot, the handcart, the wheelbarrow, the horse drawn cart, wagon, the carriage and later the bicycle and finally the automobile.